It’s time of the month again for the latest updates for BNSF trackwork around the Pacific Northwest. If you are new to this type of post, this covers news for Sounder, Amtrak, BNSF and Union Pacific Railroads and covers passenger rail throughout the Pacific Northwest. In Part I I’ll discuss all the work North of Downtown Seattle. Blaine: BNSF and WSDOT finished the new Blaine Customs Siding and related construction several months in advance. This project will allow for faster and more reliable Amtrak Cascades trains and less delays as freight trains are inspected. Mt. Vernon: Washington Utilities and Transportation Committee has approved the closure of Hickox Road. This will allow the extension of Mt. Vernon Siding. Locals say this is a poor decision because it will add time for emergency services. The crossing will not be closed until BNSF finds additional funding to build the siding. The project is currently slightly over $1 million over budget due to modifications to the design. Stanwood: Stanwood Station is scheduled to be completed on November 11th with a grand opening celebration to follow. WSDOT will post information on the opening day and the festivities once some operational items with BNSF are resolved. Everett: Grading work for the Delta Yard expansion is completed and track and signal work will begin later this year. This project will increase the capacity of Delta Yard and support future full length coal trains and longer manifest freight trains, leaving the sidings between Everett and Blaine clear of stored trains. This will also allow for faster Amtrak Cascades trains and better movement of freight in and around the Everett region. Mukilteo: As some people may be aware, WSDOT stripped funding for several Washington State Ferry projects throughout the region. While the new ferries are badly needed, the future multi-modal stations are now mostly on hold due to the funding being reallocated to other projects. This project would have fully built out a new bus area, moved the terminal closer to where the Sounder Station is, added a new slip, and a new expanded waiting area for cars and trucks. Sound Transit however will continue with phase 2 of station construction with the second platform and pedestrian overpass. ST is currently waiting on property transactions, which are currently out of their control, to take place within the tank farm area. This must be completed before Phase II begins. Edmonds: Sound Transit will begin work on the permanent Edmonds Station next year. The City of Edmonds recommended Sound Transit move forward with the project after WSDOT reallocated funding for the full multi-modal project to various other “higher priority” projects. Final design for Edmonds Station will be completed in December with the first part of the construction to start in Spring 2010. With the uncertainly of the double track project, only the Western half of the platform will be constructed. After the double tracking is completed, the Eastern half of the platform will be completed. Magnolia: The BNSF Commuter Construction crews are continuing to work steadily in Magnolia at BNSF’s Interbay Yard. This project adds double track between Galar Street and 23rd Avenue. On Saturday, October 24, 2009, BNSF connected the new main track to 23rd Avenue cross overs (also known as a control point or C.P.) With this connection completed, BNSF will spend the next three to five weeks reconfiguring the “ladder” tracks that once connected the A-Apple and B-Baker tracks. The old main will be re-laid and will complete the double track project. The completion of this project adds nearly 10 to 20 additional trains when combined with the already completed project at Milepost 7 and 8. Passenger trains will increase to 60mph from 40mph. With the upcoming completion of Interbay, the Commuter Construction crew may be abolished unless additional funds are secured from Sound Transit. Grading for Milepost 27-28 is still on schedule for 2010 and Edmonds has permitting until 2012. The additional crossovers that were to be installed are also in limbo, pending funding shortages. Amtrak Cascades News: British Columbia and Washington State are currently looking at starting a third train. Contrary to what was believed to be funding available for a third train for FY09-11, there is not any available at this time. British Columbia would like to have 6 daily trains by 2016. According to WSDOT’s Long Range Plan, this would serve nearly 900,000 passengers a year, if the ridership is there. Currently, the extended train has been averaging 60 passengers a train on weekdays and roughly 100 passengers a train on weekends which are both climbing as promotions are made and more advertising is made. I have been informed that talks are underway with BNSF to get the prerequisites on what will be required to start this additional train. Unlike the prior incident with the Canadian Border Services, this may be a mid-day train which would in turn replace Thruway coach # 8900, a scheduled 1pm departure from Seattle. With it being a mid-day train, the issue with “lack of staffing” should be a non-issue. Tomorrow: projects South of Seattle. 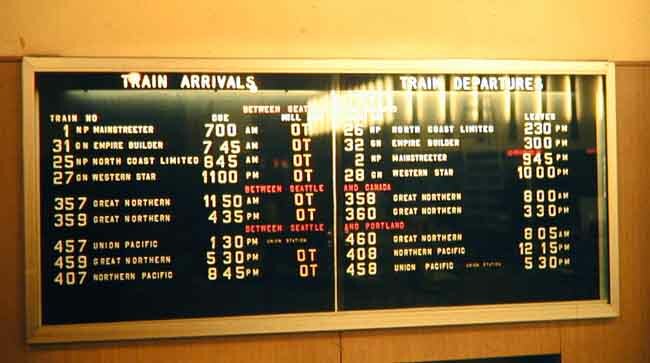 An interesting thing about that photo of the schedule board: back then, there were a lot more ways to get to Chicago by train, but we have as many or more trains going to Vancouver and Portland as we did at the time. Add in the Sounder trains, and King Street station is busier than it was in 1968. Regarding the third train to Canada, when you say that the second train has 60-100 passengers, I hope you mean only the segment between Bellingham and Vancouver. That is my understanding that only between Bellingham and Vancouver BC there is 60 to 100 passengers. I’ll fire an e-mail out for clarification since the press release wasn’t clear of where those passengers are going. (1. How much funding would be required for full double-tracking between Everett and Vancouver? (2. If B.C. now wants a third train and six trains by 2016, have they released any statements indicating their willingness to make capital investments and track upgrades? Report that just came out about Amtrak’s financial performance. From the report it’s painfully clear that long-distance services perform miserably (though the Empire Builder is best, losing only $100 per person), and that corridor services such as Cascades could well be profitable will proper upgrades. Yes, I would agree also. In addition, the GAO report was done in 2005, at a time when the Bush Administration was doing everything possible to KILL Amtrak. In response, Amtrak went into survival mode, deffering maintenance, replacement equipment, etc. continueing to the present time. The biggest flaw in the ‘hit piece’ leveled against Amtrak is the addition of depreciation to all their numbers. The Cascades quadriples in net operating subsidy to $32 per passenger using that methodology. OK. Let’s level the playing field for all the modes, IF that is the big test. Highway bridges, overpasses, concrete, steel… you name it… has a life span. Let’s figure the replacement cost on all that, divide by 50 years or so, and see what the net cost per passenger mile is. What’s the life span for each component of ST1 and ST2? An Amtrak train uses about 2.4 gal. of diesel to go a mile, with a bunch of people in tow. Airlines burn a hell of a lot just getting pushed back and taxiing from the gate. Each mode has its place, and the Acela performance numbers point the way for intermediate travel in the U.S. Geeze Louise, everyone else on the planet “gets it”. Divide by 30 years (for lifespan of highways). That’s the figure used by WSDOT in Cost Benefit analysis. For Sound Transit’s land leases, WSDOT uses 20 years to determine benefit. The 30year figure was based on the physical lifespan of the road surface before it needed rebuilding. Of course, the shorter the lifespan, the worse it looks! By the way, has anyone played with the numbers I posted in the other thread? I was just wondering what others come up with. HERE’S AN ARTICLE FROM THE CHINA NEWS YESTERDAY. China Southern Airlines Co,the nation’s biggest domestic carrier,expects traffic to fall by more than half on 518 of its weekly flights as a direct result of a high-speed rail network. The airline operates approximately 160 domestic routes and of these 38 will compete directly with the high-speed rail network which is due to be completed by 2020. To maintain profits the airline plans to expand its overseas flights,routes on which the airline still has a competitive edge. CSA witnessed a 60% drop in traffic when a high-speed rail link opened between Beijing and Taiyuan. More than 11,185 miles of high-speed rail lines will be constructed in China by 2020,with train tickets expected to be approximately 40% cheaper than air travel. This sounds exactly like what happened when the Spain AVE opened between Madrid and Barcelona and the TGV Est route. Flights dropped almost 60% ! The Renfe AVE trains (Talgo-made) are beyond fantastic. I’ve never had a better travel experience. The nonstop Madrid-Malaga train I was on traveled 335 miles in 2 hours and 20 minutes. And the queue to buy tickets at Madrid Atocha station for the Barcelona trains was exceptionally long. It’s an incredibly popular service. I would off the top of my head say it would run into the $4-10 billion range because of the amount of bridges, tunnels, blasting required, adding fill, wetland mitigation. $2-5 billion of that would be the Canadian section alone with a good chunk of it going to replace bridges and wetland mitigation. There could be smaller sections of double track added, like between Marysville to Stanwood and/or Stanwood and Mt. Vernon. It all comes down to money. I don’t know if it has be attempted before but if we really want to get serious about rail, we could always tax ourselves for new services and improvements. California has done this countless of times and runs nearly hourly. Plus the trains are unreserved as well. If that does happen, we’d really have to toss a bone to Eastern Washington to really make it work. I am indifferent about that report. While it is damning to see, there isn’t much that can be done about those numbers. Why? Amtrak does not own the rail line. Would that really matter? It all depends on ridership, line quality, etc. Since Amtrak long distance trains aren’t about speed and more about scenery, some would like to think it is no more than a glorified tourist train. Alas, it is a vital piece of the transportation network as it serves areas that only have access to a meager 2 lane hwy. Are there ways to improve the service? Of course but it will take money…rail is expensive but so are highways, freeways, planes, cars, buses, light rail, etc. Things that all require each other to work successfully. Regardless of cost, everyone relies on everyone to make it work. We subsidize nearly every mode of transportation. If this type of report was made on airlines, how would people react then? What about highways? Most will always counter that the gas tax covers this cover. Many, many people of Congress have already came out and flatly said the gas tax will not nor has ever covered construction of roads. There is a reason why have invested billions into the highway system. just curious which california service you’re referring to. I can think of at least 5 commuter or corridor routes that run at least hourly. The “bone” for E-WA should be twice daily Seattle-Pasco service. It would serve Ellensburg, Yakima, Sunnyside and the Tri-Cities. There should be enough business there to make it worthwhile twice a day. With Talgos the curves in the Yakima River Canyon and in Stampede would be reasonably quick, and BNSF rebuilt some of the line about fifteen years ago when they bought it back. Not on to Spokane, though. It’s too much of a detour via Pasco, and BNSF would demand that the state double track the old NP line; it’s near capacity with Portland/Vancouver/Longview freight. Well, it was until the bust and will be again. The only issue is that 80% of Stampede is still jointed rail, which is very uncomfortable on the Talgo, even at speed. Much worse at lower speeds. BN did a lot of upgrades to welded rail in curves but most of the straights are still all jointed/bolted rail. BNSF has done the majority of the Yakima Canyon to concrete ties and welded rail. According to the North Coast Hiawatha study, it would be around $70 million to upgrade the line to a full CTC system. It did not state how much it would be to upgrade the line to continuous welded rail. Thanks for the info about the jointed rail; I’m surprised at that. The article in Trains about the re-opening made it sound like they had done a fairly complete make-over between Ellensburg and the junction east of Auburn where the short-line ownership started. Is Yakima to Tri-Cities welded rail? I would expect that it may be, because I believe they kept the ownership there and do a pretty good business there. As of 5 weeks ago, that section is also jointed rail. I’m frankly surprised there are so many lines that are still jointed rail. The line from TR Jct to Freighthouse Square is still jointed rail, though it is in fair better condition that Stampede is. Too bad about the rail; Anandakos is right that twice-daily Seattle-Pasco service makes a lot of sense from a tourism and political perspective. Are there other trainsets that can handle jointed rail better? While the report may characterize long-distance trains as money losers, reality may be different. How costs are apportioned can radically affect what is perceived to be the profit or loss of these trains. How about looking at revenue versus operating costs? Any developments in using Scott Road as a northern terminus in Vancouver? As of now, no, nothing has been mentioned about Scott Road. Yeah, I agree with the Yglesias article as well. However, even if SubsidyScope/Pew inflated the numbers by including total depreciation in order to carry out a hit job on Amtrak, I still think we should have the conversation about Amtrak disinvesting from certain long-distance routes in order to invest more heavily in corridor service. For instance, as much as I love riding over the Pecos River bridge in Texas or through the Moffat Tunnel in Colorado, I feel forced to admit that the Sunset Limited and California Zephyr are indulgent and wasteful. I feel that Amtrak could do wonders for both service quality and public relations (and thus ridership) through such a reinvestment. How about Fort Collins-Boulder-Denver-Colorado Springs? Phoenix-Tucson? Seattle-Tri-Cities? Cleveland-Columbus-Cincy? Etc…Keep the lines short and run them frequently. Those long distance trains would be carrying vastly greater numbers of passengers if there were connectively timed short distance feeder trains connecting to/from them. As an example, imagine the following “feeder” trains connecting to/from a daily Sunset (trains #1 and #2): Grand Canyon Nat’l Park and Phoenix; Denver, Colo Spgs, Pueblo and Albuquerque at El Paso; Dallas, Ft Worth, Midland-Odessa at El Paso; Laredo at San Antonio; Ft Worth, Dallas at Houston. Multiply these possibilities times the dozen or so long distance trains currently operating, add a second train in each direction so that cities and towns traversed in the night have daytime service too, and you would see a huge increase in Amtrak revenue and passenger count. I wonder if one way to take on Amendment 18’s restriction of gas tax for roads would be to lobby to amend it to include heavy rail. Yeah, I would love to just have it open for transit or roads, but that’s going to be quite a fight for us. But could we make the argument to allow gas tax monies to be spent on upgrading rails and re-establishing passenger service around the State? One thing I’ve wondered about amendment 18; do the freight railroads pay fuel taxes? And if so, do those taxes get diverted to paying for roads? How about marine vessels? Since taxes are different for ‘on-road’ vs. ‘off-road’ diesel (and I think for gasoline), I would assume that the all railroad and marine users would use off-road fuel, and not that tax collected (but still have other (state and?) federal taxes paid). The off road diesel and on road diesel are dyed a different color. State Patrol can stop people and do spot checks (happens a lot down around Shelton, logging country). Marine fuels pay a hefty tax that goes into maintaining “the marine highway”. There’s different parts of the federal excise taxes on diesel so railroads likely pay some but not the portion that goes to the highway fund. I wonder if the railroads have to kick in State sales tax proportional to the amount of fuel used in the State? I know rental companies have to spread around licenses for cars and trucks based on how much presence they have in different states. Just stopped by the New Stanwood station yesterday to check it out. Very nice. Bare bones, but a nice long Sounder style platform, a couple of big metalic canopies, ADA, bus queue, and new street. The track and passing siding are all new concrete ties. What more could anyone ask for! Attended station with ticket counter, restaurant, newsstand and rental car counter? In Stanwood? The town has 4,000 people! It shouldn’t even have an Amtrak stop! If we count Camano Island (with its growing number of retirees) and if we feel that driving SOVs is to be encouraged, then why not stop at Stanwood? There is more than enough slack in the Cascades’ schedules for a stop here and eventually one in Blaine for exactly the same reasons. It isn’t just about Stanwood but also its surrounding communities that will use this station. According to the Camano Island Fire Department – roughly 18,000 people are in this area.